Placerville finds its roots as a supply town during the Gold Rush, hence the inclusion of the word “Placer” in its name, which is literally translated in Spanish to mean the bane in a river where gold dust is found. 194.74 Acres Union Mine Rd. STUNNING FULLY REMODELED PROPERTY! NEW ROOF, NEW INTERIOR AND EXTERIOR PAINT, NEW CARPET, NEW TILE, NEW BASEBOARDS, NEW KITCHEN, NEW BATHROOM! Placerville is the seat of El Dorado County. It is located in and around the intersection of Highway 49 and Interstate 80. Placerville's location provides residents easy access to the wine country in Amador County, the South Fork of the American River and South Lake Tahoe, which is a short drive up Highway 50 from Placerville. Placerville residents have easy access to skiing, hiking, biking, rafting, kayaking and fishing. Along with pretty much any other outdoor activity a person could want. The Placerville real estate market consists of everything from older homes with interesting architecture in and around Downtown, to tract homes around the outskirts of town, to large custom homes on sprawling parcels of land on the rural perimeter of the town. There are even a few condos in Placerville and some multi-unit income properties for investors. Residents can find numerous small businesses and restaurants in town, along with grocery stores and county services. They are also a close drive to El Dorado Hills and Folsom, where just about any big box store and a new mall can be found. Throughout the year, Placerville residents can enjoy events held in and around Dowtown, include the Hangtown Car Show, The Bell Tower Brewfest, The Art and Wine Festival, Christmas Parade and many others. 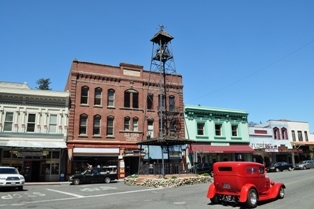 There is always something going on in Downtown Placerville.